Srinagar, Feb 11 : The Kashmir valley remained cut off from the rest of the country for the 6th day on Monday following closure of the 300-km-long Srinagar-Jammu national highway due to landslides, triggered by snow and rain last week. Closure of the highway has resulted in severe shortage of essentials, particularly vegetables, chicken and meat in the Kashmir valley, where the prices of local vegetables has also increased many fold. Meanwhile, the historic 86-km-long Mughal road, linking Shopian in south Kashmir with Rajouri and Poonch in Jammu region remained closed since December last year due to accumulation of several feet of snow which has now frozen. The 434-km-long Srinagar-Leh national highway also remained closed and there is no chance of early reopening of the only road connecting Ladakh region with Kashmir. Efforts are going on to partially restored traffic on the highway to clear the stranded vehicles, a traffic police official told TNN. "After clearing landslides and shooting stones on Sunday, we allowed stranded trucks carrying essentials for Kashmir in the afternoon from Udhampur. However, when the vehicles were moving towards Kashmir, there were fresh landslides and shooting stones between Ramban and Ramsu," he said adding traffic was again suspended. The National Authority of India (NHAI) and Border Roads Organisation (BRO), immediately started operation to clear the landslides and shooting stones. The work is going on to put through the highway in the afternoon partially, he said adding only stranded vehicles, particularly trucks, would be allowed to move towards Kashmir. "Fresh traffic will be allowed only after all stranded vehicles are cleared," he said. The road condition of the Srinagar-Jammu national highway is unpredictable as nobody knows when there will be landslides or shooting, particularly between Ramban and Ramsu, Superintendent of Police highway said. He said the NHAI and BRO are working round the clock to keep the highway open. However, he said, frequent shooting stones and landslides forced authorities not to resume traffic on the highway as it could prove dangerous. Recently two persons were killed and three others were injured after they attempted to cover the shooting stone prone area on foot. They were hit by shooting stone. 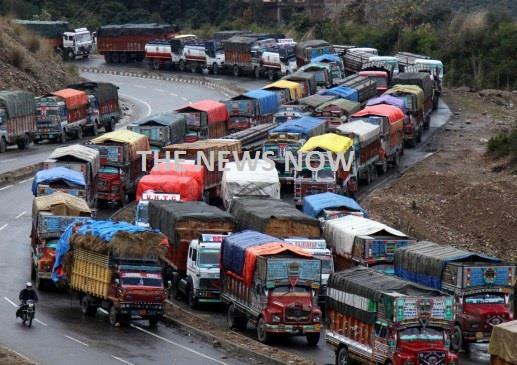 Meanwhile, official sources told UNI that over 3000 vehicles, mostly carrying essentials for Kashmir valley, are stranded on Udhampur and other places on the highway. Similarly, over 2000 trucks, including those loaded with fruit besides empty oil tankers are stranded on this side of the Jawahar tunnel, including Qazigund. The local residents are providing food and water to truckers and other stranded passengers at Qazigund and other places on this side of the Jawahar tunnl. The road is also slippery at several places, including Jawahar tunnel, Banihal and Patnitop, sources said some persons were injured when a vehicle skidded off the road in Ramban area this morning.